Happy International Women’s Day! Let’s embrace our wobble and celebrate our success. I wanted to pay respect today to Hong Curley, a Traditional Chinese Medicine practitioner and friend, who has helped me significantly in the past two years. At the same time, I also want to thank all the women (and men) who are the reason I am here today, which includes you 🙂 The photo is: Lama Tendar, Hong Curley with Forrest, and myself. Disclaimer: Please note, this story contains strong themes, which may distress sensitive readers. It was a sticky afternoon on the Gold Coast as I stood in the grass, holding my belly. Over 37 weeks pregnant, I had dragged my fiance, now husband, Kris Anderson, to a Tibetan singing bowl workshop with Lama Tendar (the Dalai Lama’s chantmaster, who is based in Melbourne but visits Queensland). I met Tendar at the Mind Body Spirit Festival around 2011-2012. His palm was one of the first images I posted to my facebook page, The Numbers Queen I captioned it ‘bent but not broken’, because even though his thumb is limp (the result of torture), his spirit is free. As much as I loved Tendar’s sound healing, it was difficult to sit, so I wandered around. I noticed a face – Hong Curley – in the crowd. I had just read her story, ‘I am not a worthless piece of s#!t’, in Living Now (founded by a fellow 29/11 Lifepath, Elizabeth Jewell Stephens). Awed, I introduced myself, and asked for her DOB. We discovered she was a 31/4 Lifepath (Heart Healer/ Builder), while her husband, Mike Curley was a 29/11 Lifepath (Spiritual Messenger). Find your lifepath. I bought a copy of her book, Freedom to Love, before we left. Little did I know how much this would change my life. I asked Hong if she liked motherhood, and she said, ‘I have enjoyed every single minute of it’. At the time, I was shocked, because I had never met someone so positive, but now I know, she was telling the truth. Hong texted that night, with a long message of encouragement for my pending labour. I couldn’t believe a stranger would care so much. Nevertheless, I was glad for her advice, because within days, I gave birth to Forrest (see his 11:11 birth story). Hong’s words ‘pain happens, but suffering is optional’, made a great difference during his 15-16 hour waterbirth, which was completed with the help of a midwife, without drugs. I was so proud of myself, Forrest and Kris for the team effort. While recovering, I read Hong’s book while feeding Forrest. Nursing while lying down was the only way I could get enough sleep. By the second page, I was sobbing, and this trend continued throughout the next few weeks. To give an idea, she starts her book with the story of Da Shan, a boy who begs her for twenty cents at a bus stop one cold night, when she’s returning from university. She feels so sorry for him, she wraps him in her scarf and beanie and gives him $100. As he reaches up, she is shocked to see he has only stubs instead of hands. Unable to sleep, Hong asks her father about the boy. She discovers he is only nine years old. One of 10, 000 people who came to town after a flood (which killed his father), he is forced to beg to support his grandparents, mother and four siblings. Unfortunately, he discovers he is too small to compete against the other beggars. After his baby brother dies of starvation, he asks his mother to chop off his hands so he can attract more mercy from people. Hong begins feeding his family from that day onwards, with the help of her Dad. Now can you see why I cried over this book? As an Australian-born Chinese, whose relatives fled to Hong Kong and Singapore during WW2, it’s in my DNA to care about people in need. Maybe that’s why I’ve done charity work since primary school, and ended up studying Holistic counselling and spirituality. 1) Stop Holding Back. While staying at Hong’s house last year, she noticed me filling a bottle for Forrest. She said ‘that’s a small bottle’ and I said ‘it’s the one we got when he was a baby, you’re right, it is little’. Hong asked ‘why don’t you give him more milk?’ and I said ‘because I don’t want him to be greedy’. As I said it, I knew I was coming from a place of fear rather than love. Hong and I then had a long talk about poverty consciousness and imprinting children with their parent’s limitations. She also introduced me to an eco-friendly cryptocurrency she supports, which you can email me about – I’m happy to discuss their packages with you, as Kris and I are also involved (please put ‘crypto’ in the subject). Truth be told, I still use that bottle for Forrest, but I now fill it with almond mylk (either store-bought organic, or home made) and Forrest can have as much as he likes. This transition was suggested by Milo Milosevic, our family’s naturopath and homoeopath at the Quantum Healing Centre in Brisbane. Milo also treated Hong’s family. It’s amazing how much Forrest started eating, once we reduced his dairy. He had become so picky, he was barely finishing his crackers before then. I’m not a fan of milk, as I was born lactose intolerant and am a mum, so the idea of keeping cows pregnant, and taking their calves away after birth, feels wrong. There are other forms of calcium that are more easily absorbed. That said, I eat meat, and am not claiming to be a saint. As I’ve written in this post on common diseases, our allergies/ diets often lead us to our tribes, so it’s best not to judge. What I learned: Just because your life is so hard, doesn’t mean your children have to struggle the exact same way. Stop making them reinvent the wheel, give them driving tips instead. They chose you, hoping to learn from your mistakes and stand on your shoulders. Instead of thinking in black-and-white, aka ‘carrot or stick’, think ‘carrot sticks’ and use your kids as an inspiration to get educated and improve everyone’s wellbeing. 2) Toddlers Are Teachers. Hong told me a story about her daughter, Grace, that has always stayed in my heart. When she was two, Gracie picked up a grain of rice and stared at it for a very long time. Hong was about to tell her to hurry up and eat it, but something stopped her. Eventually, Gracie said ‘Mum, God is in this grain of rice’, and Hong was floored. 4) A Mother’s Voice, Heals Her Daughter. This is my favourite story about Hong. 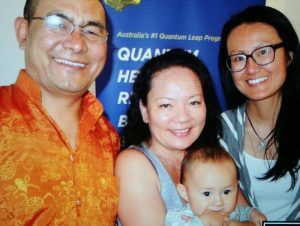 During her Quantum Healing Retreat in 2016, she told us the harrowing news that her mother had had a stroke (I note that Hong was in a Personal 9 Year at the time, which can bring huge tests and blessings). Hong and her mother have had a challenging relationship, to say the least. 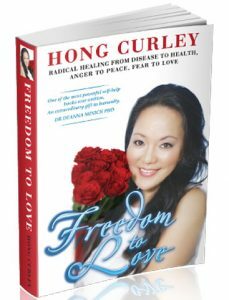 There has been considerable violence (physical, emotional and spiritual), that Hong has needed to work through as part of her healing journey. Hong mentioned that, having to shower her mother like a baby was incredibly confronting, and made her cry. Hong also said that, when the Australian doctor told her to tell her mother she would never, ever sing again, she purposely mis-translated this part, reassuring her mum that her voice would come back. This made her mum hug the doctor with joy, which left Hong with a lot of explaining to do! At the point, Hong asked us to welcome her mother to the room. Imagine a tiny, sparrow-like Asian woman slowly walking in, clearly still in recovery, then bursting into the most beautiful Chinese opera song you have ever heard? Just writing this, I am crying again. Hong and Mike Curley have helped me truly understand the phrase ‘home is where they understand you’. It’s not easy being a first-generation Australian – I’ve battled bullies and racism no end, and still cop flak from relatives for being a girl (in China, they might have aborted me). Nevertheless, I have fallen and risen over and over again, becoming a truly deep being in the process. As they say, ‘smooth waters do not make for skilful sailors’. Living Now article on Hong and her mother – I am not a worthless piece of sh#1t and How did she forgive her family’s killers? I’d also like to acknowledge Vivian Tong from The Quantum Healing Centre, a Master 33 Lifepath (Spiritual Rockstar and Master Healer), who has always given me hope and been a cheerleader at so many events. 9 Lifepath Kids – My Tips For Handling Old Souls In Young Bodies!